Madison County was created 21 March 1806 from Chenango County. The county seat is Wampsville. 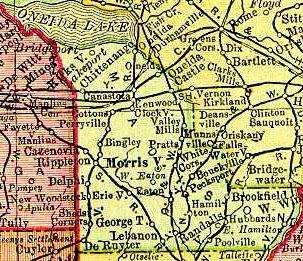 The towns of Hamilton, Brookfield and Cazenovia were formed in 1795. Peterboro was named for Peter Smith. Peterboro was a haven for abolitionists. Peter and his son Gerrit sold over 100,000 acres of land in New York and surrounding states. Gerrit financed John Brown's raid at Harper's Ferry. According to his later writings, he didn't know what the money would be used for, he was simply showing support for his friend as he had in the past. He also wrote that he had committed himself to the Utica Insane Asylum because he was upset over what had occurred. Some think he did this to avoid prosecution for treason! Catalogue - DeRuyter Institute - 1840-41. 1872 History of Madison County. Notice! For informational purposes only. The gentleman whose address is mentioned on the above web site is no longer providing this service. A list dedicated to finding relatives in Madison County. SEARCH the ENTIRE Madison County NYGenWeb site. Please note that names may be listed as firstname lastname and lastname, firstname on the site, so please use both combinations when seeking a specific individual. The next meeting of the Madison County Civil War Round Table will be ? Selected Births, Marriages, Anniversaries, Interesting Tidbits from old newspaper clippings. It's History - Proceedings of the Semi-Centennial Jubilee - General Catalogue - 1877. The Madison County Historical Society?s Mary King Research Library has many items to assist the researcher interested in discovering his or her own family?s history or learning about local history. The library also contains vital statistic files of marriage and death notices abstracted from the society?s newspaper collection from 1854-1931. The researcher also has available, records culled from family bibles, others? research and gathered into family folders, church and cemetery records, local histories, and city and county directories that span the years, 1879-1972. In addition, there are Atlases and microfilms of both Federal and State censuses from 1800-1920. As a policy, the Madison County Historical Society charges $10.00 for research requests by mail or email, which includes four copies, each additional copy is $.25 per page. The research library is open to the public Monday- Friday, 9-4 year round, appointments are recommended. There is a $5.00 fee for in-house use of the library for nonmembers and no cost for members. Photocopies are $.25 per page. (Please inquire about membership applications). Mail ins: $25 for records search under 25 yrs and $70 for records over 25 yrs. Location: Rt. 46 & Williams St.
Fryer Memorial Museum has an extensive genealogical collection. With the researcher in mind, all names mentioned in the collection have been placed on 3 x 5 cards alphabetized and filed. The genealogical collection contains newspapers, scrapbooks, Bible records, family histories, obituaries and donated genealogies. Cemetery records for Madison County and lists of burials in neighboring counties are also in the museums holdings. Fryer Memorial Museum is an all volunteer organization. There is no charge to use the facilities, but donations are always welcome. View a map of Madison County from the census bureau. Madison County place names - (alphabetical) from the US Geological Survey. Then you can view a map of that place. You are our welcome visitor since 25 Aug 2011 -- thanks for stopping by! There were 12,582 visitors to our previous host from 20 Nov 2004 to 25 Aug 2011.